The Full Moon is Wednesday July 20. Venus and Mercury return to the evening sky. Jupiter is visible in the early evening. Mars and Saturn are visible all night long. Saturn is close to the red star Antares and forms a triangle with Mars. 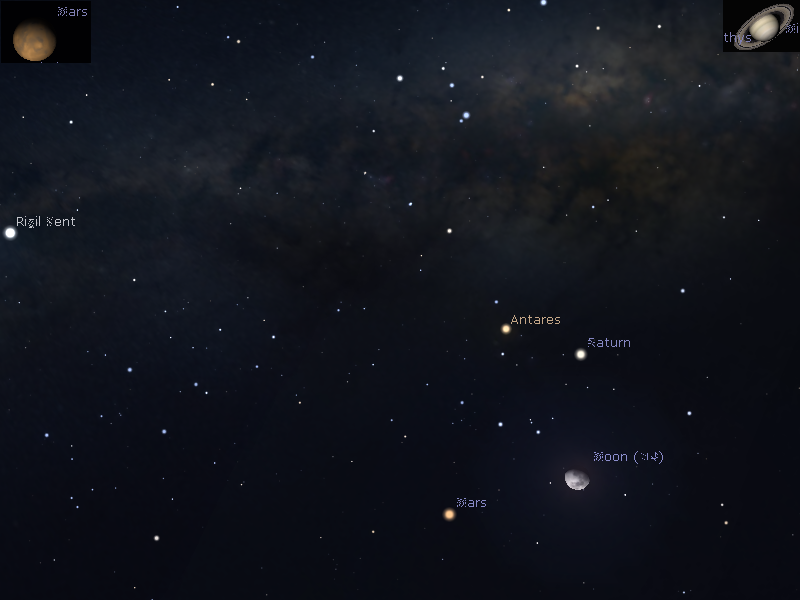 The Moon is close to Mars and Saturn on the 19th. Comet C/2013 X1 PanSTARRS may be visible in strong binoculars in the evening sky. The Full Moon is Wednesday July 20. Evening sky on Saturday July 9 looking west at 30 minutes after sunset. Jupiter is above the close pair of Venus and Mercury. Similar views will be seen throughout Australia at the equivalent local time. (click to embiggen). 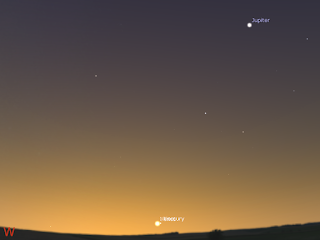 Jupiter is in the north-western evening sky as the sun sets, and is good for telescopic observation from around 18:00 on until around 9:30 pm when it will be a little too close to the horizon. Jupiter's Moons will be an excellent sight all evening. Venus and Mercury emerge from the twilight glow this week, although they will be difficult to see until late in the week, and even then you will need a clear, unobstructed horizon, like the ocean, to see them effectively. On Sunday 17 July Venus and Mercury are very close together, but are just four finger-widths above the horizon half an hour after sunset, so this will be a challenging observation. 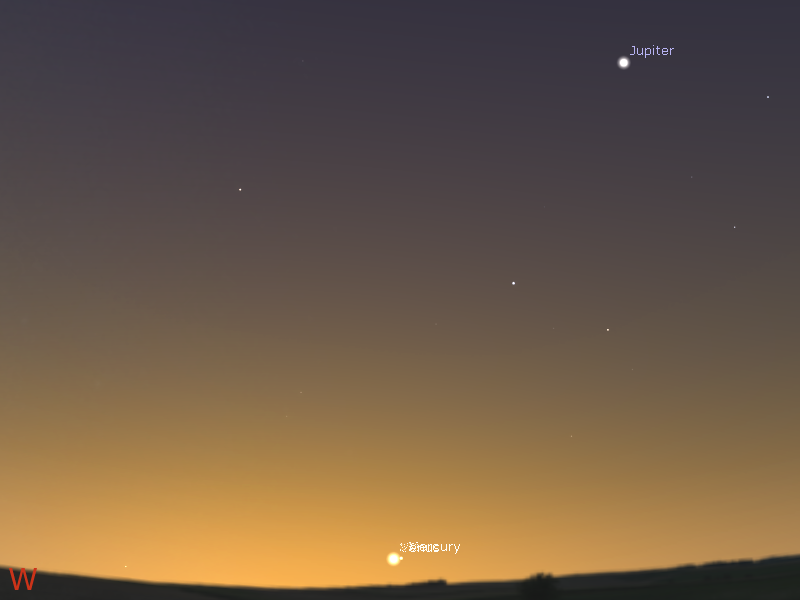 You may need binoculars to see Mercury. Evening sky on Friday July 15 looking west as seen from Adelaide at 22:00 ACST. 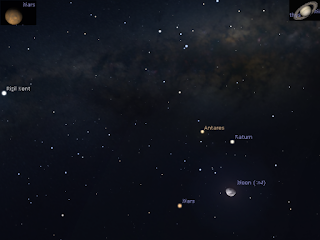 Mars, Saturn and Antares form a triangle, and the waning Moon makes a kite shape with them. The inset shows telescopic views of Mars and Saturn. Similar views will be seen elsewhere in Australia at the equivalent local time. (click to embiggen). Mars continues to head back towards the head of the Scorpion this week. Mars forms a line with the star Dschubba in the head of the Scorpion and Anatres. As well Mars forms a triangle with Saturn and the red star Antares. Mars was at opposition on May 22, is visibly dimming, but is still a decent telescope object. It is visible all night long. In even small telescopes Mars will be a visible disk, and you should see its markings. The waxing Moon is close to Mars on the 14th and 15th, and Saturn of the 15th and 16th. The best display is on the 15th when the Moon, Mars, Saturn and Antares form a kite pattern in the sky. Comet C/2013 X1 (PANSTARRS) rises around 4:00 pm local time, and is clear the of horizon murk from around 7:30 pm. It is currently around magnitude 7.2, however, the waxing Moon is very close to the comet this week, making it very difficult to see even in a telescope. The comet will be close Centaurus for much of this week. Detailed maps and guides are here.